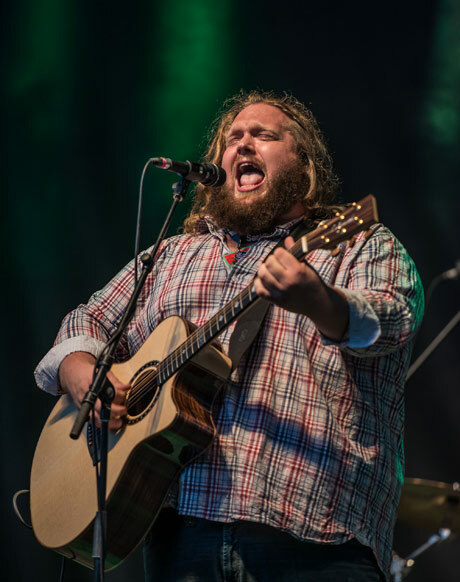 Matt Andersen knocked down a crowd through pure creative force on Sunday night –– any opposition, anyone in the front row, anyone in the surrounding area. Over the course of his Regina Folk Festival main stage set, he managed to break two strings, but he plowed through the songs regardless. Whether someone was on the other side of Victoria Park or ten feet away from him, it was difficult to tell whether it hampered him in any way. The New Brunswick blues man showed off how much of a clear natural gift his voice is. The songs from his latest LP, Weightless, allow for some dynamics in his singing, but it was the full-voiced moments that threatened to demolish nearby buildings with greatness. Though he was accompanied by a mandolin player, Andersen's own acoustic work was a wonder, filling out his folk blues songs entirely. It's rare to see someone so accomplished make something look like it could be so effortless, but between his voice, his guitar work and his songwriting talents, Andersen pulled it off.